This topic contains 4 replies, has 4 voices, and was last updated by Jmullican 2 years, 8 months ago. shouldn’t this question be false because it says “the DEFENDER’S GOAL LINE” instead of the OFFENDERS GOAL LINE? No penalty directly results in a safety, but if a distance penalty is enforced from behind the defender’s goal line toward his end line, it is a safety. Do you know what question number this pertains to in the study guide? I’ll double check it. The Louisiana High School Officials Association was formed in 2009 to provide officials for the interscholastic sports programs of Louisiana. 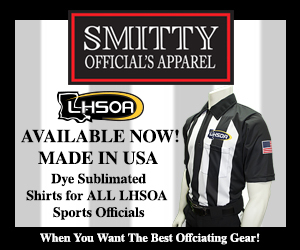 There are more than 6,000 officials in the LHSOA that are registered by the Louisiana High School Athletics Association (LHSAA) to officiate in 7 different sports.